Sarah Metzker Erdemir is an expat writer and ESL teacher living in Istanbul since 2002. A fiction writer for more than 25 years, she began freelance writing and editing in 2000. Ms. Metzker Erdemir holds Bachelor of Arts degrees in Romance languages and linguistics as well as a TESOL Master of Arts degree. She has written articles for eHow, Garden Guides, and ConnectEd. Pepsodent is a brand of toothpaste that has been sold since the 1920s, when it was the sponsor of popular radio programs like “Amos 'n' Andy” and “The Bob Hope Pepsodent Show.” There are two types of Pepsodent available: Original, and Whitening with Tartar Control. Like most toothpastes, Pepsodent contains a blend of abrasives, fluoride, flavors, sudsers, humectants, binders, sweeteners and preservatives. Pepsodent's active ingredient is fluoride, which makes up .25% of the total ingredients. Since the 1960s, toothpaste has contained fluoride to help prevent cavities. All modern ADA-approved toothpastes contains fluoride. Fluoride works by strengthening the calcium phosphate in teeth enamel. Sorbitol is a humectant. Humectants draw moisture from the air and keep a product moist, and they hold the water that is put into Pepsodent when it's manufactured. Without sorbitol, the toothpaste would dry into a hard powder. Sorbitol also acts as a sweetener and makes Pepsodent more palatable. Silica is the ingredient in Pepsodent that gives the toothpaste its abrasive quality. Toothpastes must be abrasive to remove plaque, stains and debris. The abrasive also has to be mild enough that it doesn't scrape tooth enamel or damage gums. PEG 32 stands for polyethylene glycol. The 32 means it is one of several polymers of this chemical. PEG 32 is a common ingredient in cosmetic products, and it serves multiple functions in Pepsodent. It works as a binder to keep the ingredients from separating over time. It also acts as a humectant to keep the product moist. Sodium lauryl sulfate is another ingredient that is quite common in cosmetic products. In Pepsodent, it is a detergent that makes the toothpaste foam and lift debris from your teeth. Even though sodium lauryl sulfate is quite mild, it causes allergies in some people and oral ulcers in others. SD alcohol 38 B is another name for ethanol, or grain alcohol. It is used in toothpaste as a solvent and to decrease viscosity, meaning it helps to thin the product. Although ethanol carries the same risks as the kind of alcohol people drink, there is not enough of it in toothpaste to be of any major concern. Pepsodent has a minty flavor similar to wintergreen that is derived from the sassafras plant. 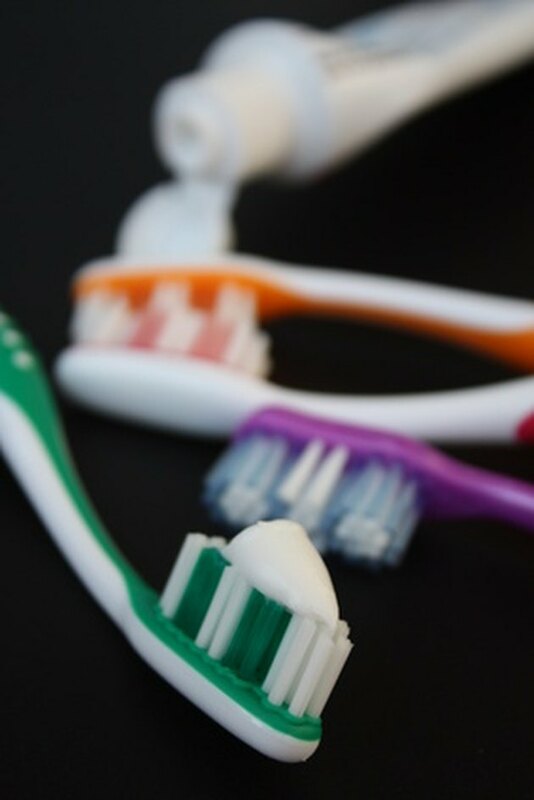 Flavoring in toothpaste is necessary to cover up the unpleasant taste of the detergent and other ingredients. Cellulose gum is a binding agent in Pepsodent. Zinc citrate trihydrate is a whitening agent in Pepsodent. Its job is purely aesthetic, as it does not actually clean teeth or gums. Sodium saccharine is in Pepsodent to make it taste sweet. Titanium dioxide is used in Pepsodent as a dye. It makes the toothpaste white and opaque. Canadian Centre for Occupational Health and Safety (CCOHS)(http://www.ccohs.ca/headlines/text186.html) warns that titanium dioxide dust is potentially carcinogenic, but this chemical nonetheless is used in over 70% of cosmetic products. "Chicago Tribune:" Whiter Days Ahead For Pepsodent?